RBTH editors note: A little more than a year has passed since a referendum was held on Crimea, which led to a treaty being signed between the peninsula and Russia. This has been the source of enormous controversy between Russia, Ukraine and the West and many foreign embassies warn against travel here. As a result of economic sanctions that were passed in response to this event, traveling is not easy in Crimea: Practically no international airlines land here and visitors must bring fistfuls of cash with them. Bankcards and credit cards are not accepted anywhere, although it is possible to change foreign currency in banks. Crimea attracts thousands of tourists from around the world every year. They come for the bright southern sun, the scent of pine, lavender and the salty sea, the carved rocks and secret bays, ancient history, mystical places and distinctive architecture. It is possible to visit all the major attractions of the peninsula in just two weeks, while participating in informative tours and quests and spending only $300. But only the Tour de Crimea team knows how. Daniil Antonov, Ildar Iskakov and Irina Ryzhova, the organizers of the scooter marathon Tour de Crimea, have assembled teams of romantics craving complete freedom of thought and movement and protesting the rule of boring hotels and scheduled lives. Tour de Crimea was born out of the initiative of close friends and adventurous travelers. 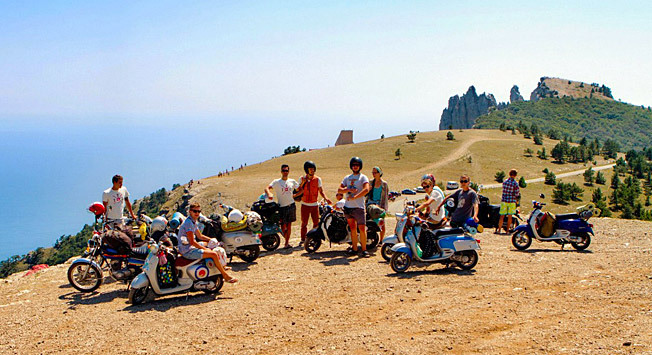 In 2008 Daniil Antonov decided with a group of like-minded people that Crimea was a great place to travel around on retro scooters and they hit the road. Since then the adventure has been repeated every year and even has gained the status of an unofficial festival on wheels. Today the global mission of Tour de Crimea is to show sides of Crimea to travelers from all over the world that they haven’t seen before with the wind and the hum of engines whistling through their ears. This year the Tour de Crimea team had to organize two shifts: the first set out on a trip in mid-July, while the second started at the beginning of August. According to tradition, members of each shift of the Tour de Crimea meet with the organizers from Moscow and ride a specially organized bus together to the peninsula. In Anapa (1208 km from Moscow) they stop to pick up the rest of their fellow travelers and continue to their final destination. Scooters can be reserved online, while those who have their own moped can have their personal “iron horse” sent directly to their destination using a special transport car. During the trip you won’t go hungry or have to eat canned food, nor will you have to worry about your luggage or health. The Tour de Crimea team is followed by a food truck, which offers wonderful hot meals for the entire length of the trip. To provide for the comfort of the procession of scooters a trailer carrying the participants’ baggage follows just behind. To ensure everyone’s safety, the group is accompanied by a doctor if the need for first aid arises. Of course, you have to be prepared, as sometimes you may have to sleep outdoors. You can forget about a steady internet connection and you won’t be able to have a shower every day, but you can always bathe in the warm waters of the Black Sea. These trifles are more than made up for by various quests and contests with prizes and excursions around the peninsula’s wildest and most heavenly places. Of course, accidents happen along the way, people get lost occasionally or can’t find the place where they have to stop. “But all this is soon fixed, and adds pepper to the days of riding around on scooters,” says Irina. The program includes visiting the Baydar Valley with the Kozyrek Waterfall, the Red Caves, the Cheremis Waterfalls and the “Bochka smerti” (death barrel), infamous for the many rumors and black legends surrounding it. The surviving “barrel,” which has a diameter of 1.8 meters and is two meters high, hangs out over a 360-meter cliff overlooking the sea. In the walls and fields there are openings that are used as observation and shooting points. Until very recently a legend circulated that posited that Nazi soldiers during World War II shot Red Army prisoners in the “barrel” and threw them into the sea. This brought the ominous name to the site. Today this is a magnificent vantage point with a gorgeous view on Cape Aya and the entrance to Balaklava Bay. You can visit all the most important sights of the Crimean peninsula in two weeks. The route of the Tour de Crimea goes through the eastern part of the peninsula, including Yevpatoria, Sevastopol, Balaklava, Feodosiya, Yalta and Kerch. These are all guaranteed stops on any of their tours. The prices for this adventure on wheels are surprisingly low: a passenger ticket starts at $85 dollars for a two-week trip, while the full package, including all excursions, extracurricular activities and the scooter, starts at $300. To make a long story short, it’s an inexpensive and adventurous way to spend your holidays. I didn't know what to expect from Tour de Crimea and was a little worried about not speaking Russian and travelling in a group. Usually I travel by myself, without a schedule and I'm very attached to my freedom, but TDC is a perfect way of travelling in a group I think. You have a lot of freedom, there are plenty of people to talk to and the schedule is very relaxed. To my surprise, a lot of people spoke very good English. I liked the atmosphere and made some very good friends who I will definitely see again soon! TDC also made me fall in love with motorcycles. I don’t have a license, so I had to ride with others, but I learned a lot about them. I especially loved camping on beaches and being out in nature. My favorite moments were the evenings around the campfire when people would play guitar and sings songs. I hope I can join TDC again next year, this time with a license to drive a scooter.